Where were you two years ago today? Remembering that first day on the Amalfi Coast, I went back and looked through my photos from two years ago. I love how the camera stops time, how it freezes moments that we can go back and relish again. Here are some moments I will never forget . . . 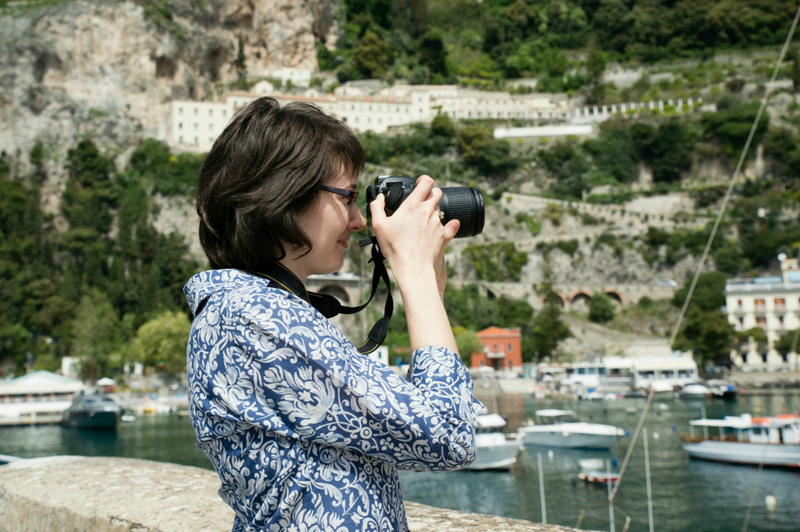 I would love to hear memories, stories or thoughts about your first visit to the Amalfi Coast! Yesterday there was very large fire in the mountains above Praiano, which has fortunately been put out by three squads of the vigili del fuoco (fire department) from Salerno and Maiori. 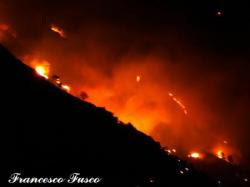 The impressive photos above of the fire are by Francesco Fusco and are from the news updates on the Positano News website here and here. 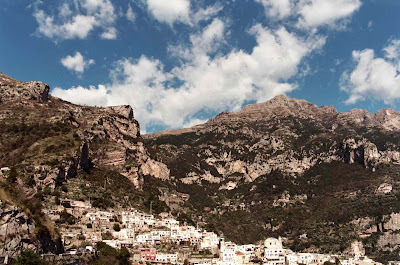 Massimo Capodanno has incredibly shots of the fire here and here on his blog Positano MY LIFE. 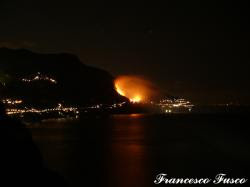 This one taken from his house in Positano is particularly scary since you can see just how close the fire was to Praiano in the distance. It has been dry and windy here the past few days, and yesterday was especially windy. I am not sure the cause of the fire, but the wind certainly didn’t help. I am very glad to hear the fire has been put out! I hope everyone had a buon Carnevale yesterday! I only caught the tail end of the events in Amalfi, but I saw the float they had of The Simpsons, which is a very popular show here. Today I have been poking around the web to see what took place around the Amalfi Coast yesterday for Carnevale. The video above shows the big floats they had in Maiori for the parades. The one with the moving Native American was particularly impressive. I drove through Maiori late in the evening and saw a lot of costumed people out enjoying the music and celebrations. It looks like there was a great parade and celebration in Positano. They had 12 floats! 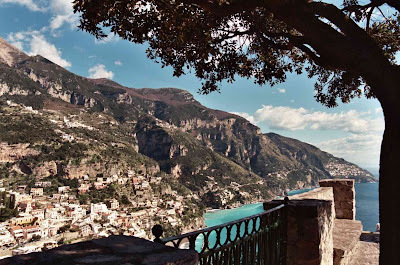 Massimo Capodanno over at Positano MY LIFE has posted photos, beautiful as always, of the events in Positano. 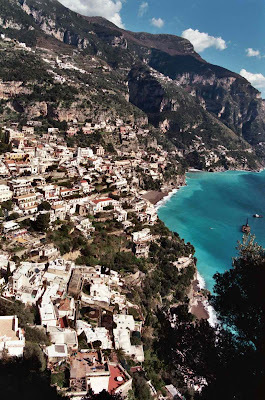 Angelica in Positano posted fun photos as well on her blog. Positano News also has a nice page of photos of the parade and floats. I just came across this video about Carnevale in Maiori, and it has some great shots showing just how much work goes into making the floats for the parades. How was Carnevale celebrated where you live? This past week has been Carnevale time in Italy, although here on the Amalfi Coast it is not nearly as elaborate of an affair as the famous Carnevale celebrations in Venice. But this time of year, I find I often have that lovely city on the mind. Michelle Fabio, of the fabulous blog Bleeding Espresso, wrote a nice article on the history of Carnevale in Venice at Italy magazine. This week she also treated us to a recipe for a traditional Carnevale pastry called chiacchiere in her What’s Cooking Wednesday post. Michelle does a great job of explaining the tradition and unusual name of these tasty Carnevale treats. I couldn’t resist trying to make them! I had company coming for Sunday lunch, and first thing Sunday morning I was in the kitchen making my first attempt at chiacchiere. (I must thank Michelle again for the tips on buying baking powder here in Italy. Always something new to learn!) It was fun, and they were a big hit! I will certainly make these every year for Carnevale now. Click on over and take a look. 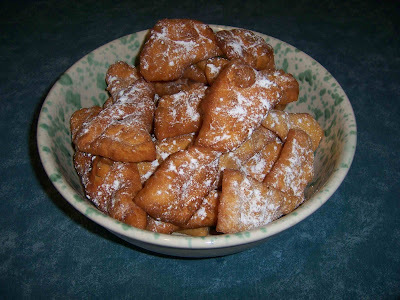 You have one more day until Martedì Grasso (Fat Tuesday), so now is the time to make chiacchiere! From what I have heard, Maiori has the biggest Carnevale celebration of the cities along the coast, and that video does a nice job of capturing it in photos. Tomorrow I will be with family, and I am not sure I will be able to catch any of the celebrations in the area. But for me, it is a day to be with family and enjoy a good meal together, which will traditionally include lasagna (yum!) and, of course, more chiacchiere (yum yum!). Buon Carnevale to everyone! The Amalfi Duomo Webcam is Back! Many thanks to my Mom who alerted me this morning that the Amalfi Piazza Duomo webcam is back online. Great news!! 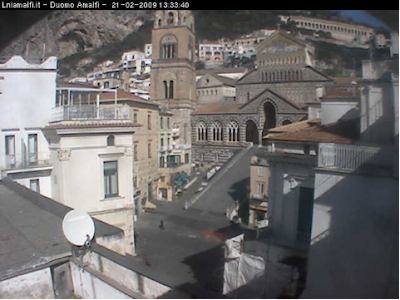 This is my favorite webcam on the Amalfi Coast, due in no small part to my love of the Duomo of Amalfi. (In fact, I wrote my masters thesis on that lovely facade you see up there.) Click here to go the live webcam now. I have also included the link over on the left, under Webcams. Click on the Amalfi link to go to the Lega Navale Italiana website that hosts the Piazza Duomo webcam and another great one of the port of Amalfi. 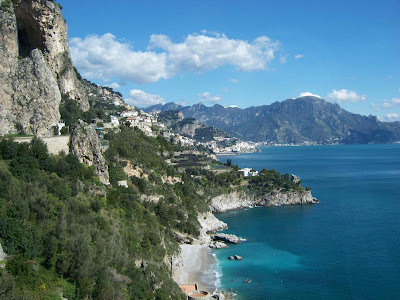 Speaking of webcams, I have an ongoing list of some of the best in the area that I have been intending to update here on Ciao Amalfi. This just inspired me to get to work! If anyone has any suggestions for great webcams in the Amalfi Coast/ Sorrento/ Naples area, please drop me a line or leave me a comment. Grazie!